You might think that a full-sized laptop is the best option to stay connected while you’re on the move, but netbooks are emerging as the computer of choice for many Japanese users. Seated next to me at Adtech Tokyo was this Japanese gentleman who was practically typing up all his notes in a terminal no bigger than my palm and another in front of me who is working on a super small Japanese made brand netbook. Netbooks are relatively inexpensive. With a price tag of under $500, it’s feasible for many users to have a larger laptop or full-sized desktop at home and keep a netbook on deck for travel. For users on a budget, it’s hard to beat the price of a netbook, especially when basic features like the Internet and the ability to run Windows applications are preserved. while on a business trip is significantly diminished compared to the cost of a laptop. 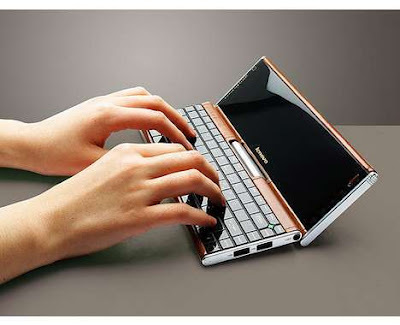 Netbooks are lighter and more portable than their full-sized counterparts. Sure, a 17” laptop is far more travel-friendly than a desktop, but a 10” laptop is more travel-friendly still. This is a gadget that will fit neatly on even cramped economy tray tables—as well as in your tote bag, backpack or large purse. And with a weight well under 4 pounds, its definitely portable to be carried anywhere. Netbook is definitely the trend and no wonder there are to be found everwhere in Japan.